I remember reading that she hated hydrangeas. threw them down on the stage because of her deep aversion. with a person who could hate hydrangeas. Well I read this years ago and who knows, maybe I’m not remembering it right. I believe it was an article about Madonna. It just stuck with me because I think hydrangeas are so magnificent. There’s a YouTube clip on that? Good grief. I guess you’re right. I almost have to wonder, WHY? When we lived in Spain, there were villages in northern Spain where walls and fences were covered with hydrangeas. They were so beautiful in their rainbow colors. They were kind of like colorful hedgerows. 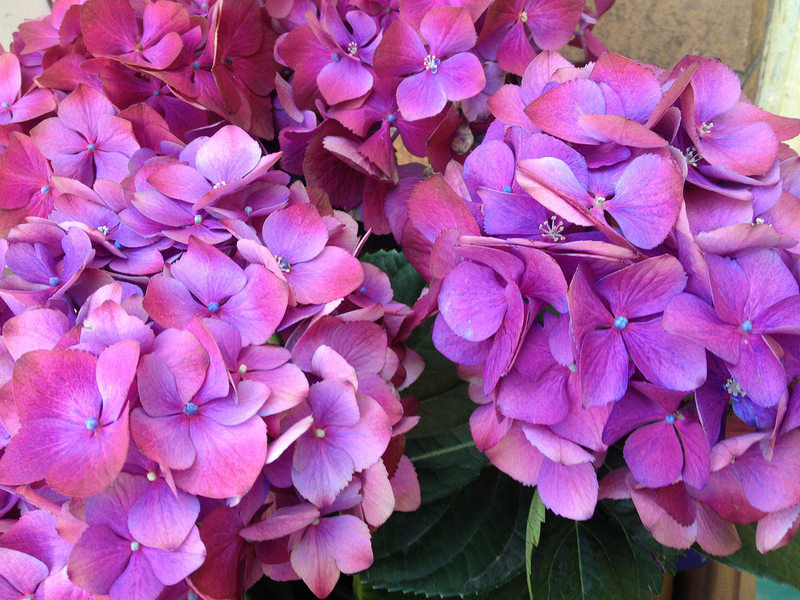 We fell in love with hydrangeas, and would love to grow them, but it’s too dry out here in the southwest high desert. Oh they are so beautiful here in Pennsylvania. So many variations of pinks and purples and blues and even white. I love the word “hortensia” in Spanish. I agree. I love all those names. Yes! I love this. These are so beautiful. The colors are so wonderful. Anger, prejudice, and hurt will cause us all to reject the beautiful and the sublime.